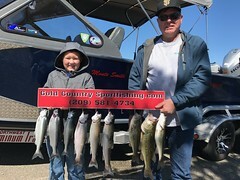 New Client Jodie brought along his grandson Andrew for a day’s fishing at New Melones on September the 7th. We met at the ramp and was greeted with some unwelcome wind, it wasn’t unfishable but it could have been better. We were soon under way and soon had lines in the water. A very short time went by and we had our first fish of the day on and was soon in the cooler. We had a good bite going for us landing some and loosing some as well, there was a full moon in the sky and I knew the bite would die off, so I was hoping they would land as many as possible before it did. 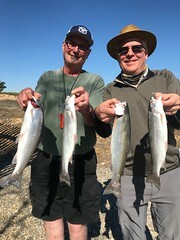 We had four fish in the cooler when the bite died, it was like someone turned the light switch off, but we stuck with it and by the end of the day they had seven nice rainbows from the waters of New Melones. Thanks again guys!! 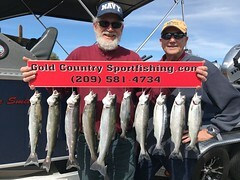 This entry was posted in California, Gold Country, Kokanee, Melones, New Melones, New Melones fishing guides. Bookmark the permalink.